On a fantastically cold spring night at the “Mike” The Indy Eleven took on 2015 NASL Fall Champions in week 2 of the NASL Spring Season. The match was built up to be a closer one with the Eleven coming in off a 0-0 draw to the Tampa Bay Rowdies, and the Fury coming off a devastating loss to the Champions New York Cosmos away last week. The Eleven would improve with 2 points following the 1-1 draw setting them up for a fantastic show down with the New York Cosmos at Michael A. Carroll Stadium, under the lights next Saturday at 7:30 PM ET. Here are a few take aways from the match from our editors. Possession was key to the success in this match which made it go both sides in the first half alone there was 8 shots from both sides of the ball. In the 59th Minute Idan Vered scored for Ottawa assisted by Jonny Steele making the Eleven struggle until the final 20 minutes when Nemanja Vuković would equalize giving the Eleven the draw. Multiple offsides calls were made against the Eleven in this match. Many times the Club would attack the flanks to get the ball into the box to attack on goal. This of course is a good strategy but it can hurt the team with offsides calls, giving the opposing team a chance to begin a new attack. Sometimes when the Club scores it can not be counted due to offsides calls. Of course if this was the case otherwise the Eleven would have won the match 2-1. I believe the Eleven has done fairly well thus far in their 2016 Spring Season Campaign. The Club’s overhaul is definitely showing it’s worth and Tim Hankinson is definitely proving to be the figure the Eleven needs to be successful this season. When it comes to the last few matches it’s important to remember we are facing the 2015 “Big 3” with Tampa Bay, Ottawa (2015 NASL Runner Ups), and the New York Cosmos (2015 NASL Champions). 2 Draws is definitely a good start to the Club’s Campaign and a win against the Cosmos would be HUGE for the club. Tim Hankinson said in the post match press conference “In order to be the Champions we must beat the Champions” Which should add a little fuel to the fire as the Eleven prepares to host the New York Cosmos next week. 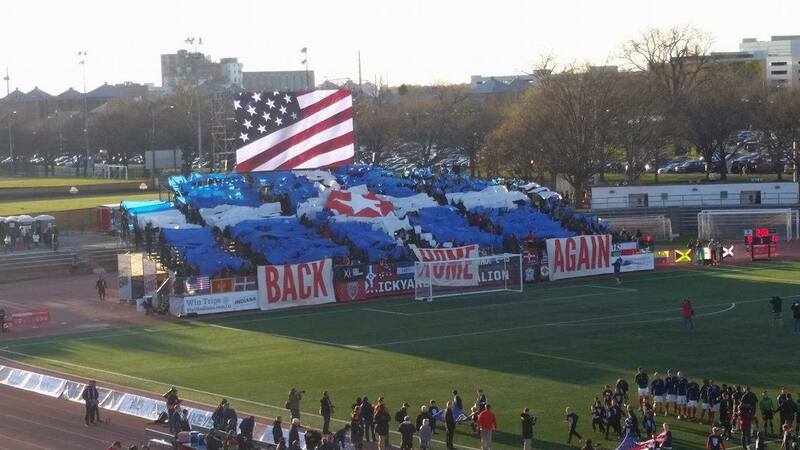 At the end of it all the Fans also had a major victory last night with 9,000+ Fans in attendance along with a fantastic tifo presentation by the Brickyard Battalion it will only get better from here. Next week the Indy Eleven will take on defending NASL champion New York Cosmos at “The Mike” for a 7:30 p.m. ET kickoff (live on WISH-TV, ONE World Sports and www.ONEWorldSports.com). Originally from Indianapolis, IN Ayers contributes all things Indy Eleven Professional Soccer from the NPSL Club all the way to the Senior Team. Ayers has past experience contributing MLS coverage for the Inscriber Online Magazine. Ayers studies Communications at Indiana University - Purdue University - Indianapolis.